Deadbeat Heroes – Punching above its weight? It’s been said before that here at BGE we like a good indie game. So when a title comes along that looks interesting and different from the rest of the crowd we like to dive in. 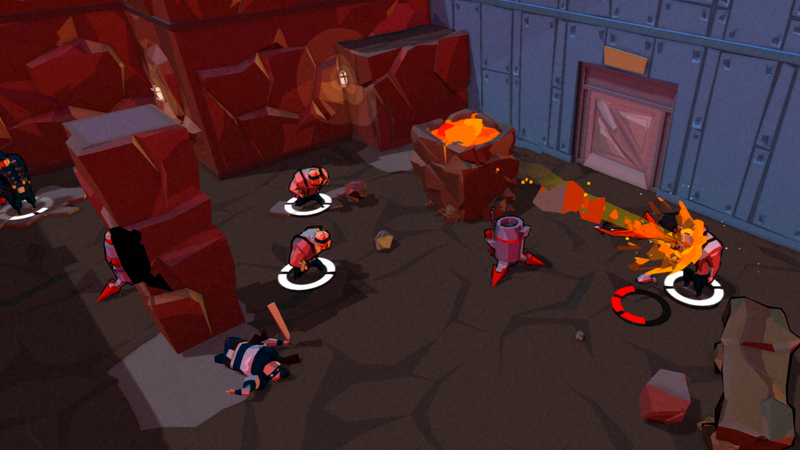 Deadbeat Heroes can best be described as a 3D brawler, crime-fighting, cockney caper. Essentially, it involves a guy in a suit, sporting an unusual fist that can quickly reduce any unsightly characters to a broken heap on the floor. But it does this via interesting art direction and simplistic but enjoyable gameplay. It might look simplistic, but underneath lies an entertaining title. There are several indie games that spring to mind that demonstrate some unusual but interesting art direction, and gameplay. Virginia, Cuphead (review coming soon) and Furi all sport some really interesting visuals. These aren’t your typical, state of the art graphics that mimic real life. Instead they present an alternate take and couple it with enjoyable but diverse gameplay. Deadbeat Heroes does the same. And that’s a good thing. The gameplay is fast-paced, and involves fighting various bad guys in the streets of London. But instead of using the same old variety of moves and punches often utilised in other games, Deadbeat Heroes seems to take a leaf out of Furi’s book, by introducing new moves and having to use those to combat specific enemies. More importantly, though, it also allows you to just smash the regular thugs in the face, while having to adapt for the more dangerous boss battles. But even the thugs often require an alternate approach. Furi, also had this, albeit in a game with just boss battles. And each boss required a specific approach. The problem was that the boss battles could last up to 45 minutes, which can be a little aggravating at times, and repetitive in some cases. ‘Combo fatigue’ sets in relatively quickly. But Deadbeat Heroes gets around this by allowing you to mindlessly pummel the thugs in the face, all while adapting to cater for different boss battles as well. More importantly, though, the ability to block attacks isn’t a factor here, which encourages a more proactive approach to each encounter. Each encounter involves punching, leaping, wall-running or using powerful special moves to clear the way. Some thugs use only their fists, meaning they can be dealt with in the typical knuckle-related manner. Others, however, carry weapons, such as pistols or wooden planks. Though these thugs carry weapons they can still be taken out via fisticuffs, but you also need to evade or confuse them in order to land a blow. Run, jump, wall-run, punch, repeat! The comic book art style is fairly distinct and stands out from most other titles. And despite presenting a 3D environment that you lord over like a god, the environment never gets in the way, ensuring a clear view of what’s going on. The sound is also entertaining. The dialogue in the story is often hilarious and I suspect intentionally stereotyped. And the prominent London gangster theme a welcome diversion from archetypal middle-eastern terrorists. If I had any issues it would be with the mission selection. After completing a mission it sends you back to the main area instead of just getting on with it. And the title used for each level is often very similar, which on several occasions made me question if I had already completed that level. But once I got used to the mission selection I knew where I stood. Deadbeat Heroes is a wonderful diversion from the regular run of well-known titles, with a superb art style and a distinct, and relatively rare London gangster scene for a game. It’s fun, entertaining, and easy to play. It’s also relatively inexpensive at £10.99/$14.99. What’s not to like? Previous Post FIFA 18 – A bold step?